The World Cup is coming to Canada. 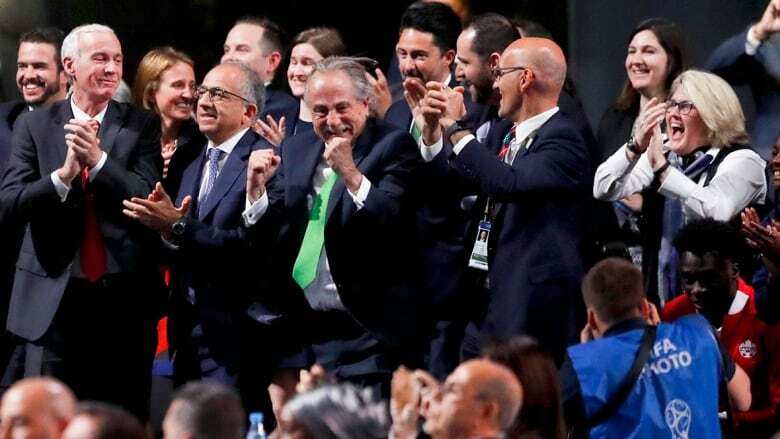 FIFA member associations gathering in Moscow on Wednesday voted 134-65 in favour of the North American bid by Canada, the U.S. and Mexico to host the 2026 World Cup, beating out Morocco. The World Cup is coming to Canada. FIFA member associations gathering in Moscow on Wednesday voted 134-65 in favour of the joint North American bid by Canada, the U.S. and Mexico to host the 2026 World Cup, beating out Morocco. There was one No vote. "Football today is the only victor," said U.S. Soccer president Carlos Cordeiro. Morocco, which has now lost five bid campaigns, was classy in defeat — congratulating the North American winners. Mexico has twice hosted the World Cup, in 1970 and 1986. The U.S. hosted in 1994. In its lone previous bid, Canada failed to get hosting approval for the 1986 tournament after Colombia pulled out. That remains the only World Cup the Canadian men have ever qualified for. The hosting decision likely opens the door to Canada finally returning to the men's world stage — a widely expected scenario as co-host that has yet to be officially confirmed. But with the tournament expanding from 32 to 48 teams in 2026, tripling the hosts would not cause as many ripples. Officials have already talked of staging three games, one in each of the three countries, to kick off the tournament. Steven Reed, president of the Canadian Soccer Association, called the FIFA Congress decision "an extraordinary honour and privilege." CONCACAF, with its president — Canadian Victor Montagliani — playing a key role in the bid, called the vote a "monumental victory" for the confederation, which covers North and Central America and the Caribbean. The current blueprint calls for Canada and Mexico to stage 10 games each, with the U.S. hosting 60. But that is not carved in stone. Edmonton, Toronto and Montreal are Canadian candidate host cities for the men's soccer showcase, expanded to 48 teams for the 2026 tournament. "It's an opportunity to bring the world together and highlight how well things work between Canada, Mexico and the United States," Prime Minister Justin Trudeau said. FIFA will select up to 16 host cities from the 23 candidates proposed in the North American bid. The mayors of two of Canada's host cities celebrated the early-morning announcement on Twitter. Both Valerie Plante of Montreal and John Tory of Toronto retweeted a video of the bid team reacting to the news, with Tory adding, ""We won! 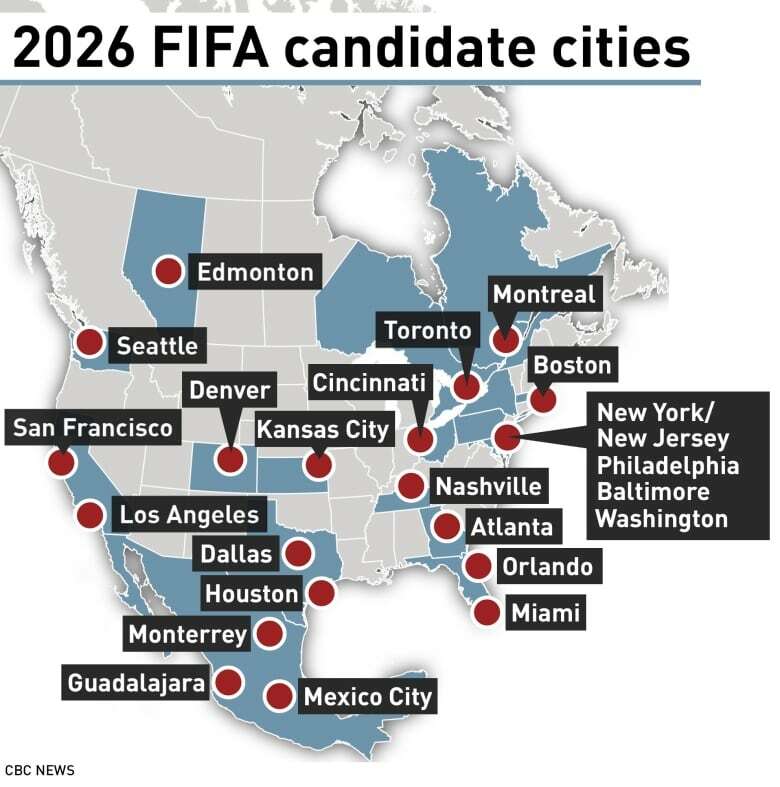 The 2026 World Cup is coming to Canada, the U.S. & Mexico!" Vancouver will watch from the sidelines after the B.C. government, citing concerns over the possible costs of being a host city, was unable to come to terms with the bid committee. Chicago and Minneapolis also withdrew, citing similar worries. FIFA's hosting selection process was revamped in the wake of recent scandals enveloping the world governing body of soccer. All of FIFA's 211 member associations — save the bidding countries — were eligible to take part in the electronic vote. In the past, only members of what was then the FIFA executive committee decided via secret ballot. FIFA president Gianni Infantino called the new voting procedure a "thorough, transparent" process. The two rivals' bids each got 15 minutes to make one last pitch Wednesday, with the North American pitch going first. 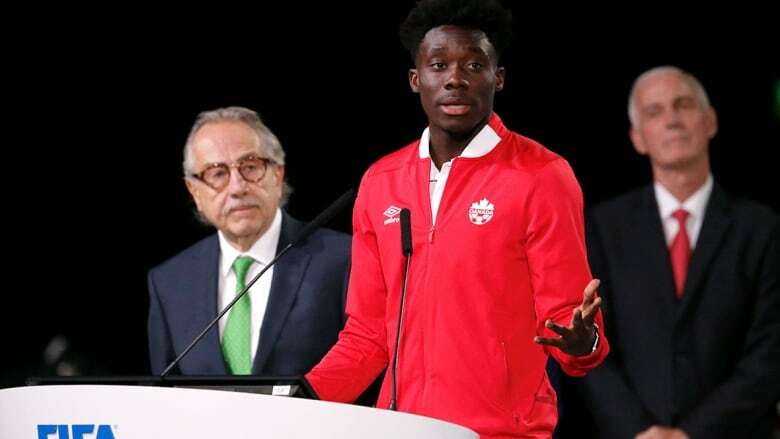 Canada turned to teenage Vancouver Whitecaps star Alphonso Davies to open its presentation. Davies's parents fled their home in Monrovia, Liberia, to escape a civil war. They ended up at a refugee camp in Ghana, where Davies was born. "It was a hard life. But when I was five years old, a country called Canada welcomed us in," he told the Congress. "And the boys on the football team made me feel at home. "Today I'm 17 years old and I play for the [Canadian] men's national team. And I'm a proud Canadian citizen. And my dream is to some day compete in the World Cup, maybe even in my home town of Edmonton. "The people of North America have always welcomed me. If given the opportunity, I know they will welcome you," he added. Reed called Canada a "growing football nation that proudly welcomes people from all over the world." A film promised natural grass on every pitch at "iconic" and "state-of-the art" stadiums already built, a sly dig at Morocco, whose stadium infrastructure is far from complete. "We expect record profits for FIFA of $11 billion [US]," said Cordeiro, perhaps hitting the key button. In its film presentation, Morocco billed itself "a country with a heart beating for football, a country where football is more than a sport." It promised a profit of $5 billion for FIFA. Fouzi Lekjaa, president of the Moroccan Royal Football Federation, noted Africa has only hosted the World Cup once. "Now we're asking for a second chance to show our abilities," he said through an interpreter. Prior to the vote, Peter Montopoli, general secretary of the Canadian Soccer Association and Canada's bid director, called the vote a "watershed moment" and a "game-changer." On paper, the two bids are worlds apart. In rating the risk assessment of both bidders, with grades of low, medium and high risk, FIFA's own bid evaluation report gave Morocco three high-risk grades (stadiums, accommodation, and accommodation and transport), 10 medium and seven low. The North American bid got 17 low-risk assessments and three medium (organizing cost, legal-government support, and human rights and labour standards). The evaluation report also offers a "technical scoring" of the two bids, with Morocco getting 274.9 out of 500, compared to the United bid's 402.8 total. The United bid plans to use 16 stadiums from a list of 23 — 17 are deemed just fine the way they are, with six needing renovation. Morocco planned to use 14 stadiums, nine of which had yet to be built with the other five due for renovation.